××gryphons come from two elements, earth and air. therefore they can control one of these. ×× gryphon bios are to be EXTREMELY detailed. Ensis is the size of one and a half men. so about ten feet tall to the top of the head. the average wingspan for creatures with large weights to be at least doube the body length. but Ensis is a shortwinged breed designed for manuevering through tight spaces quickly and agiley. 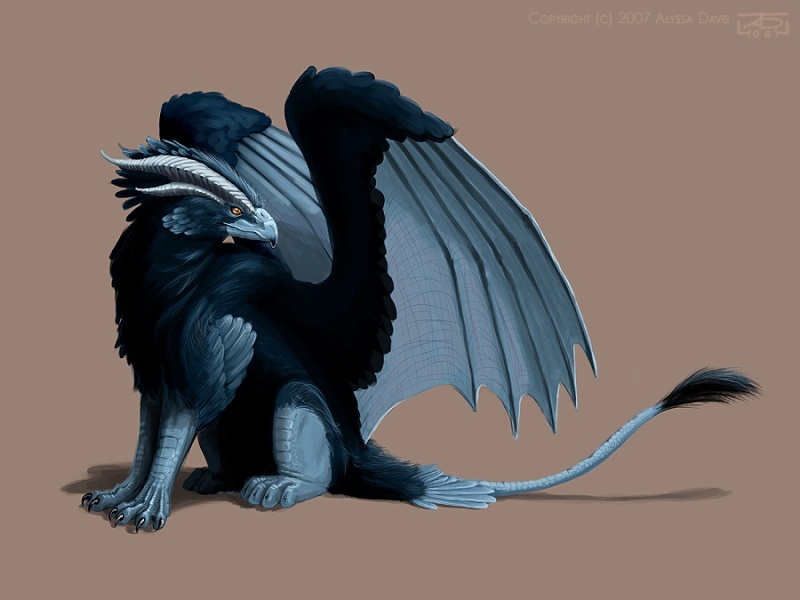 so where the normal, open spaced breed of gryphon would have a wingspan of about twenty or so feet, Ensis' is only fifteen. Being a mixed creature of earth and wind, Gryphons are able to control only one of those elements, his element is Air, even though he has lived in forests and jungles for the whole of his short life. gryphons use the elements in the ancient and traditional way of movement. with a single movement (not thought, but movement) Ensis would be able to do somthing to the air, what would depend on which movement he would make. at the beginning of time, the moon and sun had just created earth. it was raw and uninhabited with nothing other than plants. so the moon made the animals of night and sky, the sun made creatures of day and earth. the moon and sun realised that all of the creatures would cause chaos if not looked after. so, they discussed this problem and decided to make a creature made of both of their traits. they mixed part of their spirits into the new creature. when finished, the being had the head and front legs of a bird with the tail and back legs of a land animal with wings sprouting from its' shoulders. the creature was extremely large and had long, beautiful feathers. it had a noble build and was still filled with honesty and respect for all other things. the moon and sun agreed on calling the creature a gryphon. but, here they ran into another problem, there were just so many of the creatures on the newborn planet of earth that the one gryphon couldnt care and watch over all of them. so the sun and moon created more of the beautiful and magnificent creatures. in the end, there were fifty of the gryphons and they stood below the sky, looking up at the two orbs of light. the gentle moon thought for some time and brightened with happiness at a new idea. "dear Sun" she cooed in her soft voice "we both know that the gryphons are capable of governing the planet by themselves, but they shouldnt have too muchstress on their shoulders, let us create different breeds to specialize in certain lands and animals." the sun nodded, contemplating. finally he said in a boming voice "it shall be done"
and they set to work creating the new breeds. "what should we name them?" "be as you were made to be, little ones" the gryphons nodded obediantly and flew to where they were meant to be. the world was ravaged by violence and war. the mon and sun could not stand it and bade the imperials to vanish. they obeyed and were gone. no one knows truly what happened except the moon and sun. I bowed my head and laid back my plumage in the sign or respect "i am Ensis, a forest gryphon of the house of Karn." the clan name and the house name are the same. when a gryphon takes a mate, the other gryphon is admitted into the mates' clan or house, and their name changes from their birth clan to the new house of their mate.